Product descriptionTulips are the indispensable blooms of the spring garden, as they bring it to life! They are unique in range of size, shape and bold color found in almost every color spectrum, that only tulips provide. Tulips are good for a wide range of plantings, are excellent in the rock garden, in formal beds, as elegant cut flowers, and for containers. They can be used in nearly any garden design scheme. Flowers are upward facing, with linear to lance shaped green leaves on the stem. Tulip descriptions can become quite technical, as they are grouped into 15 different divisions, describing the petals, stamens, and leaves in detail. Let's just enjoy them for what they are - an incredible source of inexpensive color for the garden. 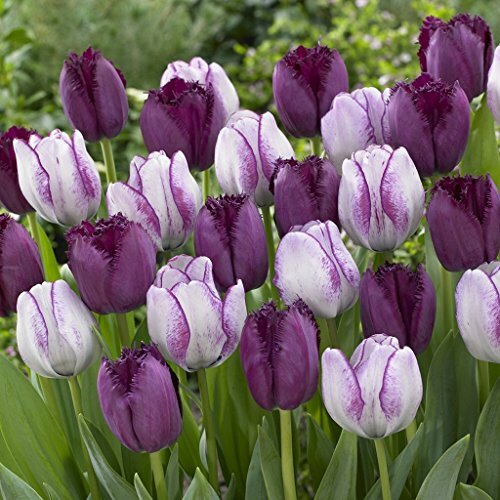 Plant several different varieties of tulips throughout the garden to extend the blooming time. Fun Fact: It typically takes about six years to grow a tulip from seed to flower. Curley Sue and Hot Pants tulips make up this purple-white color blend. The varieties on their own are very popular; however, when combined, the are spectacular due to the color pairing. One of the best-selling color blends we have on the market. Majestic and royal in color, hence the blend's name. Tulips are one of the easiest bulbs to grow! Just plant this fall in well-drained soil in full sun or partial shade for great color this spring. Our Silksart Tulip Mix is sure to delight with a brilliant range of richly warm-hued blooms and intriguing shapes. This mix contains early, mid and late flowering tulips guaranteeing weeks of lovely blooms. It creates an incredible show in any garden that will last for many years to come. If you have any questions about this product by SILKSART, contact us by completing and submitting the form below. If you are looking for a specif part number, please include it with your message.